This article shows how to Mount Amazon Elastic File System (EFS) to EC2 on Amazon AWS. For those of you who don’t know what EFS and EC2 are, here’s a one line introduction. 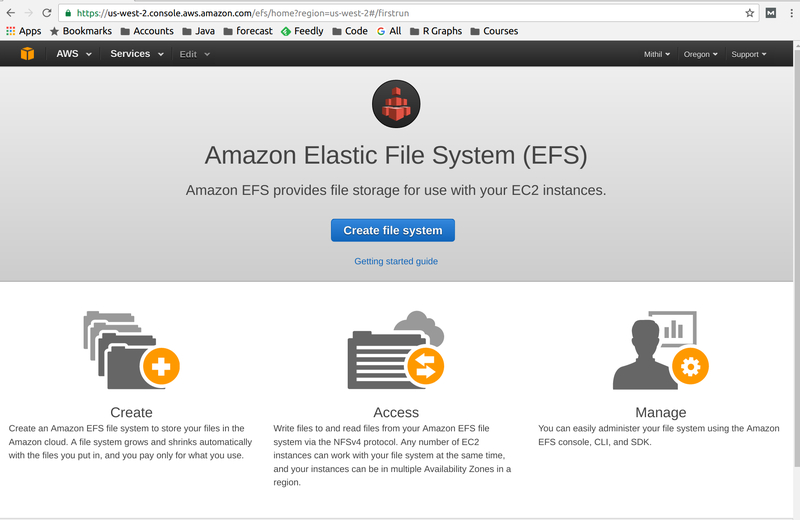 – Amazon EFS is a file system then can store petabytes of data and that can be mounted to multiple amazon EC2 machines. The File system is independent of the server. 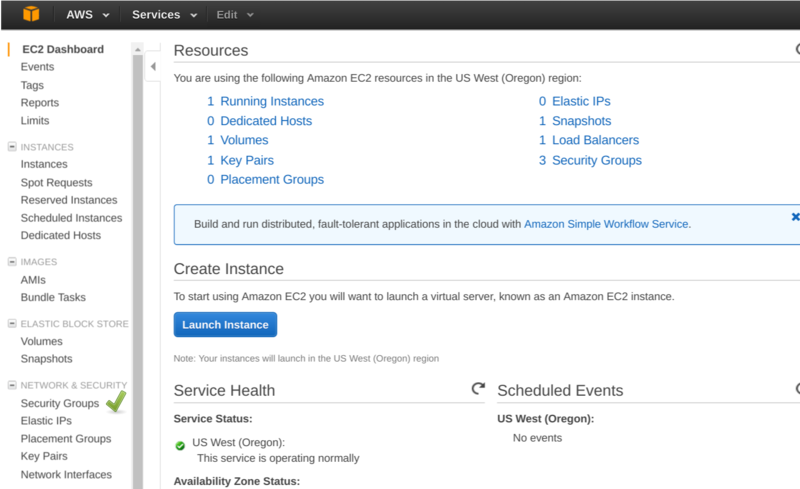 – Amazon EC2 instances are amazon virtual private machines that you can use as a computer on the cloud. 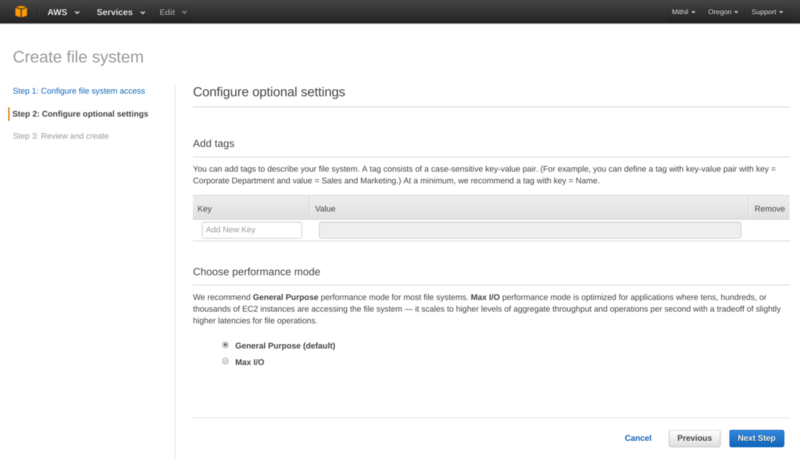 Hit Next and Step 2 says Configure optional settings. You can add key-value tags on this page. The tags can be used later for reports or billing breakdown. The last step is to review and create the File System. Opening up the port on EFS so that EC2 can connect to it. 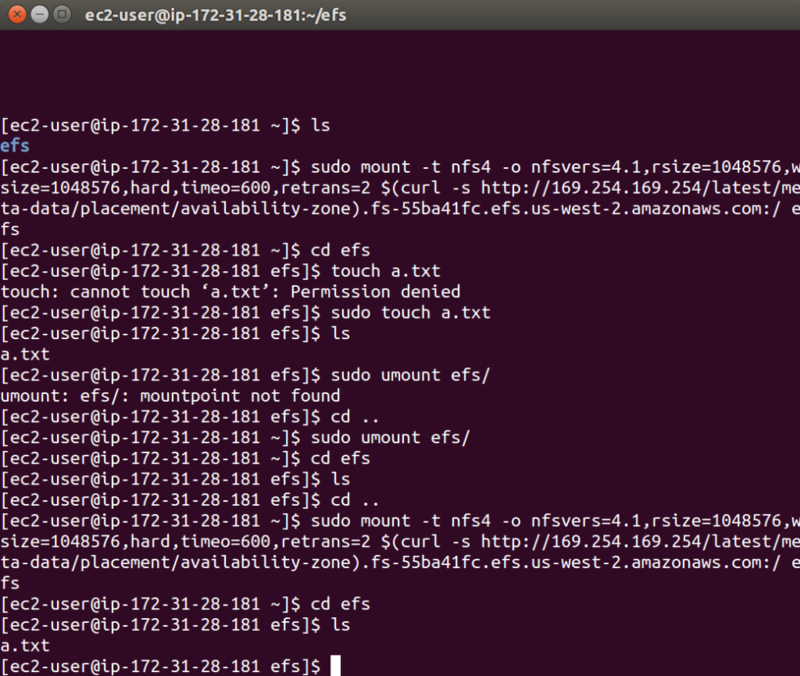 Opening up the SSH port on EC2 so that we can connect to it. 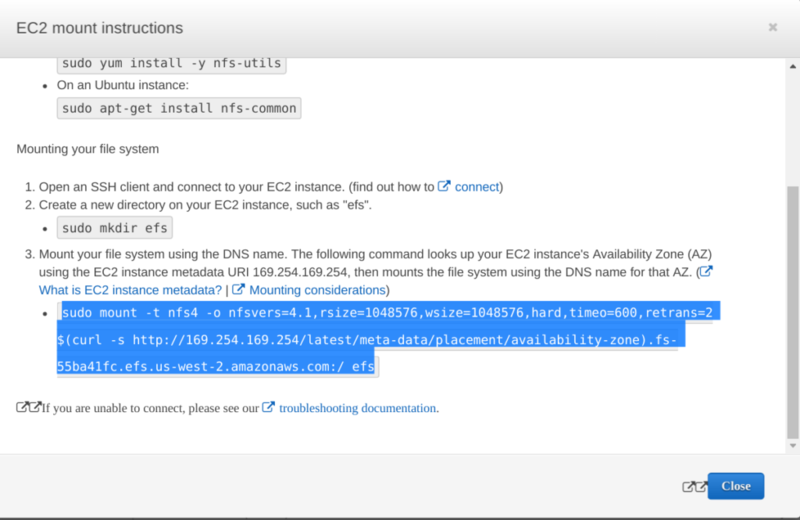 Lets first look at how to create the security group to allow connection to EFS. 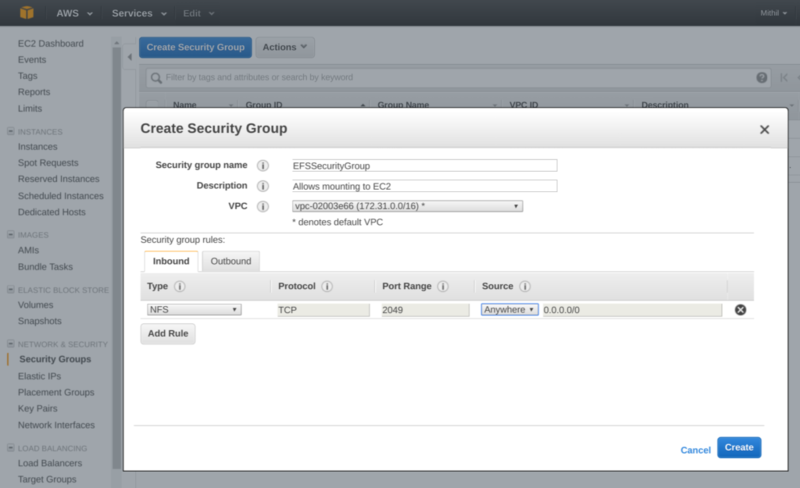 Open up the EC2 dashboard and look at security groups section on the left menu. You shoud see a create Security group popup. Enter a security group name. We have used ‘EFSSecurityGroup’; Add a description; we choose the default VPC; Add an InBound rule with type as NFS, it should auto populate protocol and port range; We select a source of ‘Anywhere’ from the dropdown but you can limit it to a particular IP; click on create. 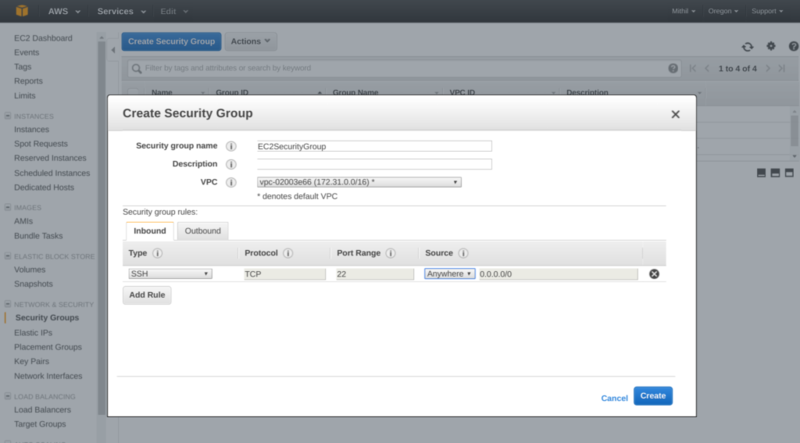 Create another security group for the EC2 instances. We use ‘EC2SecurityGroup’ for the name; Add an new inbound rule for SSH and source ‘Anywhere’ or a specific IP if you so choose. We have created the groups and now the next step is to add the groups to EFS and EC2. Go to the EFS group and click on ‘Mange File System Access’. Remove the default Security Groups and add the ‘EFSSecurityGroup’ and click on save. Similarly, assign the ‘EC2SecurityGroup’ to the EC2 instance. 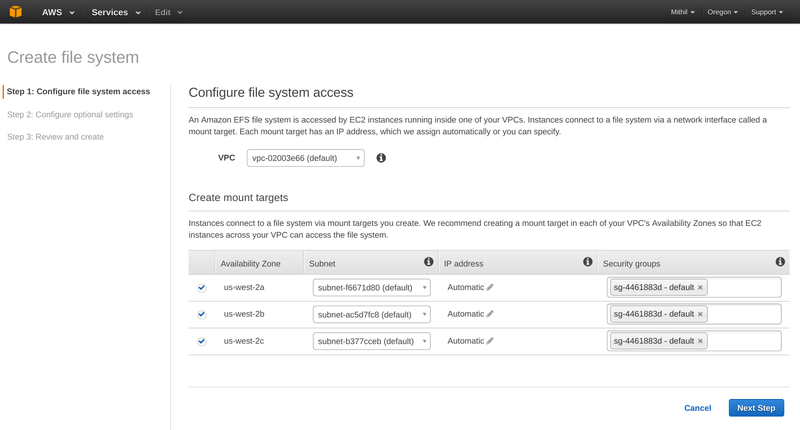 That finishes the tutorial on mounting the EFS to EC2.